Good morning everyone! I hope you are all doing well. Today I've got for you a post from Hallstatt, a cute, small village in Austria. You might have heard about this town thanks to Instagram and to be honest - I wouldn't know about it if I haven't seen it there too. It might look like it's really cold outside, yet trust me - it was really hot that day - actually so hot I had to take my coat off. I decided to wear my new favourite blouse from NAKD, which I wore last crazy since the moment I got it. I think it's such a classical piece with a really unique elements and I think it makes every look more unique. I have added a pair of black skinny jeans and my Gucci loafers, which I am wearing a lot at the moment since they are so comfy. 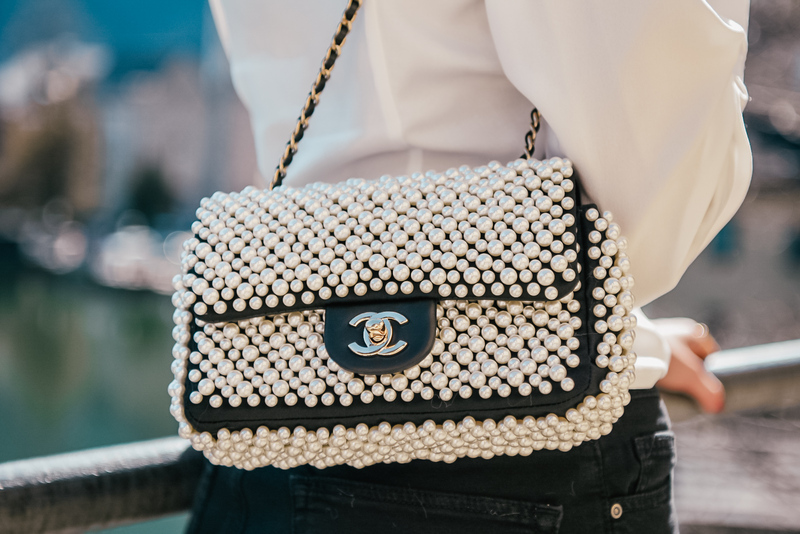 I have added my newest addiction, my pearl Chanel bag which I got thanks to the lovely personal shopper Zuzana, which you can find on Instagram as @personalshopper_duesseldorf. She was able to locate this VERY limited item within a few minutes and the whole process of buying the bag took only a few days before it arrived to me. I am very thankful for her services, so if you're looking for a special piece, make sure to reach out to her! Your look is amazing and so stylish. Love so much your bag!